To hear Kathy Griffin talk about her unsightly Donald Trump beheading gag more than four months later, you'd think she was the victim. "My mother took [Fox News host] Sean Hannity's side," she lamented at a Los Angeles AIDS fundraiser on October 8 after prancing onstage in a Trump mask waving both middle fingers. Four days later, The Hollywood Reporter canceled its invitation for her to speak at its annual Women in Entertainment Power 100 event, leading her to claim she's been blacklisted by the entertainment industry. "I just want to make you laugh, even though I don't have one single day of paid work ahead of me in the United States for the rest of my life," she said afterwards. Once again, Hollywood has demonstrated impeccable moral judgement. Griffin's lack of contrition for her cultural appropriation of a time-honored Islamic tradition is appalling. Griffin's defiant lack of contrition for her cultural appropriation of a time-honored radical Islamic tradition is appalling. Not unlike a white guy selling burritos, a white woman doing yoga or a non-Hispanic wearing a sombrero on Cinco de Mayo, Griffin's decapitation stunt emulated a sacred Islamic ritual without a full appreciation of the culture from whence it originates. Griffin, after all, is a liberal provocateur, a female artist, a supporter of gay rights – all anathema to the jihad ethos. The Islamic practice of beheading enemies and sinners dates back to the Prophet Muhammad himself. According to Arab historian Ibn Ishaq (d. 768 C.E. ), Muhammad ordered the beheadings of at least 600 Jewish Banu Qurayza tribesmen in Medina on suspicion of plotting against him. The British never formally apologized for Laurence Olivier's portrayal of Muhammad Ahmad. 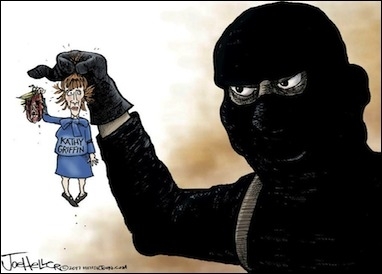 Beheading also finds support in the Koran. In one passage, Allah says "I will instill terror into the hearts of the unbelievers: smite ye above their necks and smite all their finger-tips off" (8:12). In another, Muslims are exhorted to "confront the disbelievers, strike at their necks" (47:4). In the modern era, the practice of beheading first came to Western attention when Muhammad Ahmad of the Sudan declared himself Mahdi in 1880 and waged a jihad against Ottoman Egyptian and British forces. Ahmad's followers routinely beheaded their opponents, most famously British Gen. Charles Gordon. 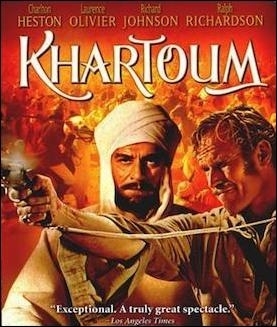 But the British had their revenge eight and a half decades later when Sir Laurence Olivier depicted the Mahdi onscreen in an infamous act of cultural appropriation. The modern video beheading phenomenon began in 2002 when 9/11 mastermind Khalid Sheikh Mohammed (KSM) decapitated Wall Street Journal reporter Daniel Pearl. KSM was captured shortly afterwards, but al-Qaeda in Iraq (AQI) leader Abu Musab al-Zarqawi took the idea and ran with it in a series of grisly videos showing the beheading of Western civilian contractors and others in Iraq. Zarqawi followed the parameters of the genre established by KSM: prayers, insults, recitation from the Koran, beheading, posing with the head. As a final insult, the ceremony ends when the severed head is set upon the back of the dismembered corpse. Beheading videos disappeared for a while but resumed in 2014 with the rise of ISIS. The prime actor in this third wave of video terrorism was English-speaking ISIS operative Mohammed Emwazi, dubbed "Jihadi John" by the British press because of his Liverpool accent and the similarities of its tone to John Lennon's voice. Griffin's body language, gaze, and triumphalist pose suggested studied imitation of jihadi videos. Griffin's defenders might dubiously argue that she had no intention of stealing the iconography from the global jihad movement. But her body language, steely eyed gaze, and triumphalist pose suggested studied imitation of ISIS and al-Qaeda videos. Her impression is impeccable except for one detail – her face is unmasked. If she was ignorant of her theft, then it's even worse, as it betrays the unaware solipsism of the Westerner who subconsciously embraces a constructed image of the exotic Eastern "other" exactly as the great sage Edward Said taught us in his groundbreaking book Orientalism (1978). Griffin must learn to indulge her fantasies in more culturally sensitive ways. Clearly Griffin's return to comedy last weekend was premature. If I may offer a modest proposal, she should take a long sabbatical for cultural sensitivity training and learn why her "othering" of Islamists was inappropriate. If and when she returns, she should follow the lead of the anti-Trump artists who have expressed their fantasies of killing a president in more culturally appropriate modes, like blowing up the White House (Madonna) or shooting the president gangland style (Snoop Dog). By turning a sacred ritual into just another internet meme, Kathy Griffin shamelessly colonized the identities of those in the jihad community. The last thing we want to do is add to their grievances.